A highly flexible and customizable magazine theme with lightening fast loading speed. 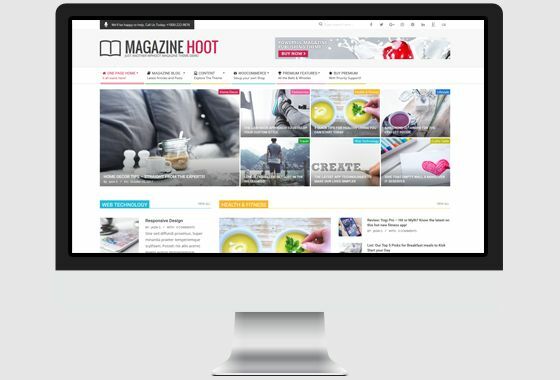 Magazine Hoot is a superfast, clean and responsive newspaper and magazine style theme designed to make your readers enjoy your published content. Speed and performance are key to magazine style themes and here the blazing fast loading speeds of Magazine Hoot deliver a pleasant browsing experience. Magazine Hoot is flexible. Use the powerful customization features to tailor the theme for your audience. Use plugins, shortcodes and widgets to place ads wherever you like. Make your site look beautiful no matter what device your visitors use. An intelligent responsive design and retina friendly icons make every pixel look perfect. Magazine Hoot comes with the popular Font Awesome library with 991 icons that can be used throughout the theme in widgets and Options Panel. Select Boxed look for a traditional design or change to a more spacious and modern look with the Stretched layout with the click of a button. The most important part of your site – Branding! Set your logo to display your Site Title, or your Logo Image, or both, along with a small one line description. Setup your online shop in 2 minutes with the very popular Woocommerce plugin. Magazine Hoot is fully compatible with extra Shop Display options. Select different Sidebar Layouts for different sections of your site. Easily set your Posts/Pages/Archives to display one, two or no sidebar (full width). Easily change the color of your site, directly from the site Customizer, to match your brand color. Add your profile link on any of the 69 included social sites. Ranges from popular sites like Facebook, Pinterest, Instagram to Bitcoin, Slack, GitHub etc. Render the footer columns using Widgets and any one of the 9 layouts. Footer area can support upto 4 columns of different widths. Showcase your content in style with the HTML Slider, or a more traditional image slider. The sliders are responsive and touch friendly (slide using touch and drag). The highly flexible hoot widgets lets you add content in a variety of ways. Simple check the Demo Home to see the Custom Widgets in action, and all the different ways they are used in to display content. Magazine Hoot is translation ready which means you can easily use a plugin like Polylang to translate all theme strings into your local language. The easy to use Customizer screen gives you the flexibility to setup your site within minutes. Use the default options or modify them to take complete control of your site. Magazine Hoot follows the best coding practices to make sure your site is robust, secure and compatible with most WordPress plugins out there. Easily create child themes and modify anything from content to layout using a myriad of actions and hooks available extensively throughout the theme. Built for Speed. Good Stuff. Magazine Hoot performs beautifully, thanks to its powerful, consistent, lean and bloat-free code. Using core functions and limiting external libraries, combining variable data and caching on need basis to minimize database queries and reduce memory consumption, and numerous other optimizations throughout the code, all add up to make your site lightening fast. Magazine Hoot Premium lets you select different colors for different sections of your site. Assign different typography (fonts, text size, font color) to menu, topbar, content headings, sidebar, footer etc. 600+ Google Fonts: With the integrated Google Fonts library, you can find the fonts that match your site's personality, and there's over 600 options to choose from. Magazine Hoot Premium allows you to create unlimited sliders with as many slides as you need. You can use these sliders on your Frontpage (within Customizer), or add them anywhere using shortcodes – like in your Posts, Sidebars or Footer. Designed for Magazine Hoot Premium, these shortcodes are very well integrated into the code to reduce loading times, thereby maximizing performance! Use shortcodes to insert buttons, sliders, tabs, toggles, columns, breaks, icons, lists, and a lot more design and layout modules. The intuitive Shortcode Generator has been built right into the Edit screen, so you dont have to hunt for shortcode syntax. Simply click the 'Add Shortcode' button, select the options in the popup, and click 'Insert'. All Done! Make One Page websites with menu items linking to different sections of the page. Watch the page animate when a user clicks a menu item to scroll to a page section. Create multiple landing pages on your site. Not to mention, you can always manually create and insert links to different sections of a long page as well!!! The floating header (optional) follows the user down your page as they scroll, which means they never have to scroll back up to access your navigation menu. Or, use the 'Goto Top' button which appears on the screen when users scroll down your page, giving them a quick way to go back to the top of the page. 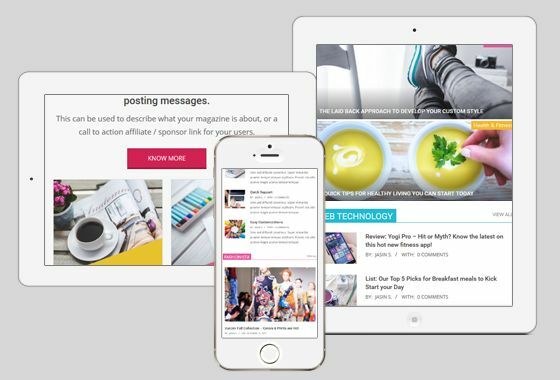 Magazine Hoot Premium gives you the option to display your post archives in 3 different layouts including a mosaic type layout similar to pinterest. Custom widgets crafted and designed specifically for Magazine Hoot Premium Theme give you the flexibility of adding stylized content. Magazine Hoot Premium comes bundled with many additional premium background patterns. You can also upload your own background image/pattern to match your site design. Select from a collection of over 991 icons to add to your main navigation menu links. Automatically open image links on your site with the integrates lightbox in Magazine Hoot Premium. Tired of the standard 'Not Found!' error? Create a custom 404 Error Page by adding custom message, images, links etc so that you do not lose your visitor. Add carousals to your post, in your sidebar, on your frontpage or in your footer. A simple drag and drop interface allows you to easily create and manage carousals. Moving to a new host? Easily import/export your admin panel settings with just a few clicks – right from the backend. CSS is passe! Developers love the modularity and ease of using LESS, which is why Magazine Hoot Premium comes with properly organized LESS files for the main stylesheet. Add custom CSS to your theme right from the backend. You can count on our support staff to help you with CSS snippets to get the look you're after. Best of all, your changes will persist across updates. Get instant updates to your theme the moment they are released – ensuring your site works with latest versions of WordPress for years to come. Need help setting up Magazine Hoot? Upgrading to Magazine Hoot Premium gives you prioritized ticket based support. We have a growing support team ready to help you with your questions. Is this a one time fee? Yes. There are no monthly/yearly recurring fees. You are free to use the theme for its entire development life cycle. Yes, you will get a license key with your purchase. Use this license key to enable updates in your WordPress dashboards. Your theme comes with a lifelong license. This means you will continue getting updates for the entire theme lifecycle. How many domains can I use the theme on? You can use the theme and activate the license on up to 3 domains. Since we are selling intangible products, we do not offer a refund policy at this time. However, if for some reason you decide the theme is not a right fit for you, shoot us an email and we will look into it. What sort of Support can I expect? Premium themes come with priority support. We help our premium users with all sorts of queries ranging from simple theme installation questions to minor customization requests and setting up child themes. Copyright © wpHoot.com. All rights reserved. Powered by WordPress.